From ancient times people have been using looms to weave cloth, canvas, and carpets. As the centuries passed, weaving became one of the first tasks to be mechanized in the industrial revolution. The various repetitive tasks such as raising and lowering rows of threads (the warp), and passing a shuttle with the cross-thread (the weft) back and forth between them, were a good fit for simple machines. Today, high-speed air-jet weaving machines are fully automated, and capable of sending a warp thread between weft strands at a rate of 2000 times per minute. One of the challenges of automating a weaving machine is maintaining proper tension on the threads. With each pass of the weft, a certain amount of tautness must be applied to the warp to keep the woven fabric uniform at all times. Early looms used the weaver’s body weight or hanging stones to keep the warp taut, but an air-jet machine needs a more sophisticated technology. 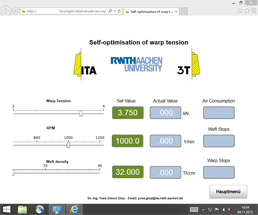 This challenge has been addressed by the students and faculty of the Institut für Textiltechnik (ITA) der RWTH Aachen University in Aachen, Germany, who are investigating how to optimize the tension of warp threads in an air-jet weaving machine. 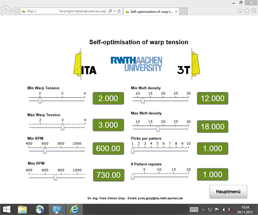 “Our main research goal is self-optimization of the warp tension,” said Dr. Ing. Yves-Simon Gloy, Research Manager at ITA, “to enable the loom to set the warp tension automatically at a minimum level without reducing the process stability.” Keeping the proper tension maximizes the speed of the process, while yielding the highest possible quality of fabric. Once the necessary hardware was in place, the team needed to choose a way to monitor and control the loom. They got in touch with Logic Park, in Heimberg, Switzerland, who recommended the Cogent DataHub® as the ideal solution. Connecting the DataHub to the iba System OPC server, Dr. Gloy and his team were able to use WebView™ to quickly build a web HMI.